Condoleezza Rice has been confirmed as President George W Bush's new secretary of state in a US Senate vote. Democratic senators sharply criticised her record in the run-up to the Iraq war during debates on her nomination. Eighty-five senators eventually backed her accession while 13 opposed it - the second-highest vote ever against a nominee for secretary of state. A Senate committee also paved the way for Alberto Gonzales to be approved as the new attorney general. The Republican-led Senate Judiciary Committee voted by 10 votes to eight to send his nomination for approval by the full Senate, with a vote expected as early as next week. 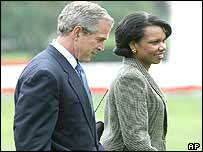 Mr Bush said Ms Rice would make "a wonderful secretary of state". The woman who held the position of national security adviser in Mr Bush's first term wins a place in the history books as the first black female secretary of state. She replaces former US general Colin Powell, who himself made history as the highest-ranking African American in any US administration when he was made the country's top diplomat in 2000. Ms Rice was sworn in at the White House a few hours after the Senate vote and is due to move into her new office on Thursday morning. A more elaborate swearing-in ceremony is planned for her on Friday. She was overwhelmingly approved last week by the Senate Foreign Relations Committee. "Outlaw regimes must be confronted. Dangerous weapons proliferation must be stopped. Terrorist organisations must be destroyed. Dr Rice has both the ability and the experience to meet these daunting challenges," said Senate Majority Leader Bill Frist during the debate on Tuesday. Massachusetts Senator Ted Kennedy, a Democrat, admitted Ms Rice had "impressive credentials". "Her life story is very moving and she has extensive experience in foreign policy," he said. "But this nomination is different because of the war in Iraq. Dr Rice was a key member of the national security team that developed and justified the rationale for war that has been a catastrophic failure - a continuing quagmire," he went on. BBC Washington correspondent Justin Webb says her confirmation was always assured but the manner of it - preceded by a bad-tempered debate and charges of lying - casts a slight pall over her accession. 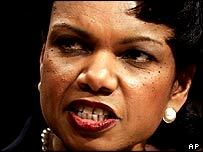 Ms Rice, 50, is a close confidante of President Bush and was closely involved in his Iraq policy. Mr Powell announced his resignation as secretary of state soon after Mr Bush's re-election in November.